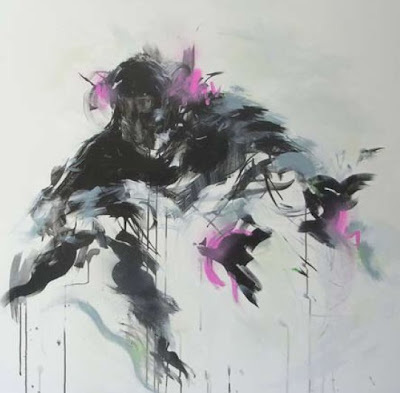 StolenSpace present the 1st London solo show by artist Mr Jago. This exhibition will showcase new work on Canvas, Silk, wood & installations, as well as the release of 2 new limited edition screen prints. ‘I see figures & form everywhere, in water, carpet patterns, shadows, clouds, everything is an abstract character and they are free’ says Jago.‘Of all weather phenomena, I find clouds the most fascinating, from the silky filaments of high altitude cirrus to the towering, threatening mass of storm-bearing cumulonimbus, clouds are as varied as the new work itself. I love cloud watching, from no where the fluffy mass morphing shapes from a cunning fox with whispy ears to familiar faces ’. Apparent in Mr Jago’s work is its loose lines and organic flow; he describes his work as ‘itchy’ and ‘dynamic’, with heavy movement and life, always searching for a new arrangement of lines. Robotic characters, and multi-layered landscapes feature heavily. The free flowing strokes and organic colours in Mr Jago’s paintings explore the ideas of space and depth in the landscapes and whilst the fast lines in his work attempt to make subject seem alive and animated. Mr Jago seems to have the ability to see a different world amongst the very mundane. These elements a very much reflective in this new body of work, and with this a looser, more instinctive style. This evolution has seen the early ‘Scrawl Collective’ scratchy style through to these more free flowing, abstract and loose paintings. The show opens to the public on the 12th of September and continues through to the 28th of September.